On this page you'll find videos and presentations designed for help developers get started developing for SHIELD. 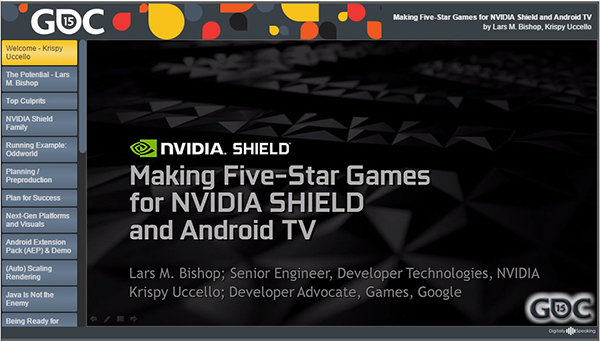 NVIDIA also provides a series of training documentation and YouTube DevCasts available to help developers get up to speed quickly with Android, Android TV and SHIELD development. 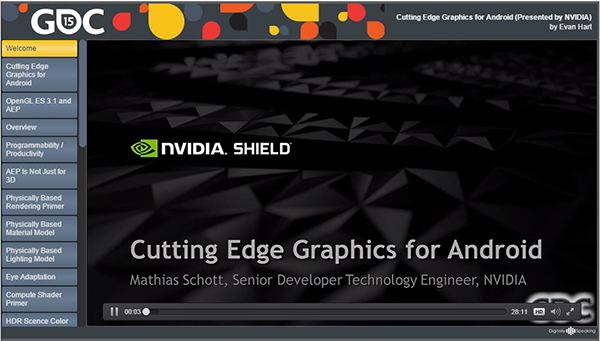 Check out our new Android DevCasts from the NVIDIA Developer channel on YouTube! Read about SHIELD and Android features in our SHIELD & Mobile Technologies documentation. AndroidWorks is NVIDIA's native Android Development solution which makes Android development as easy as developing on PC or Console. A single click installer combined with tight Visual Studio integration gives developers the power they need. 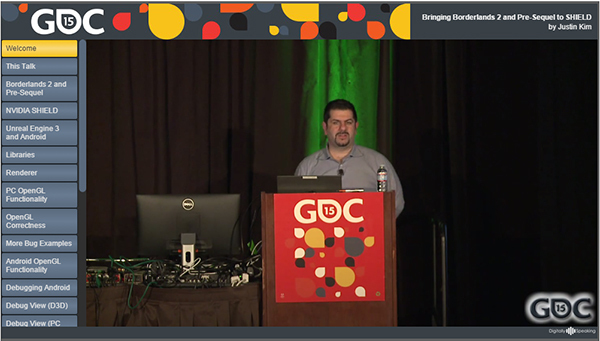 Live webinar recording from GDC 2014. Android™ games take advantage of the latest mobile technologies, such as those offered by NVIDIA® SHIELD™ and Android TV. Wowing users with great tech and great gameplay puts a game on course for five-star reviews and subsequent success. Of equal importance are stability, quality, and avoiding poor reviews that can damage a game's reputation and overall ranking. Hear first-hand accounts from NVIDIA on how we assist developers achieve great reviews and avoid poor ones. We'll examine developing natively and using a game engine, real-world issue debugging, and how one-star reviewers can be successfully converted into avid fans with great post-shipment support. The session also covers Android coding best-practices and some of the new “gotchas” that sprang forth with Android Lollipop. Plus, the speaker will introduce the most pivotal development tips for taking advantage of Android TV, a platform custom-made for the living room and great multiplayer gaming. Modern Android™ devices like the NVIDIA®SHIELD™ family have the same functionality as high-end PCs. In this presentation, representatives from several high-profile game engine companies talk about Android, SHIELD, and the future of game development. 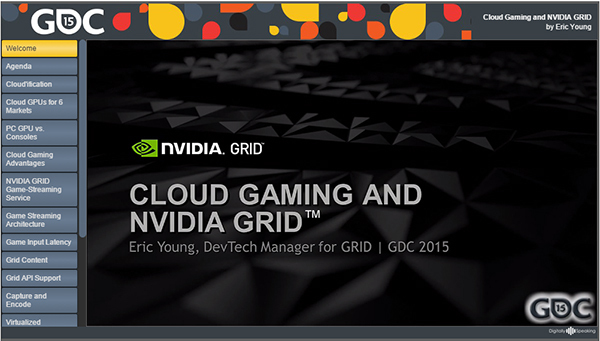 This talk focuses on providing an introduction to cloud gaming: what is the motivation and benefits for running games remotely, and why developers should be interested in NVIDIA GRID™. We’ll introduce the GRID ecosystem and briefly cover what GRID technology is capable of, as well as provide an overview of what material will be presented at the detailed GRID talks on Friday, March 6, 2015. 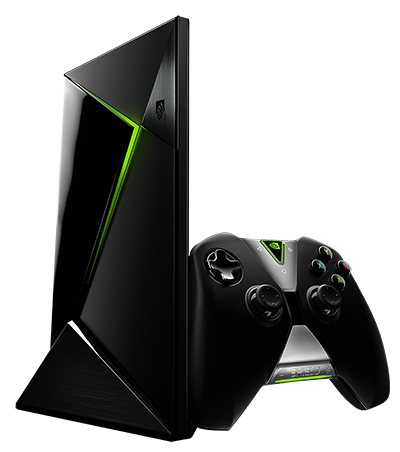 NVIDIA® SHIELD™ and the NVIDIA Tegra® processor bring the latest in cutting-edge GPU technology to mobile computing. 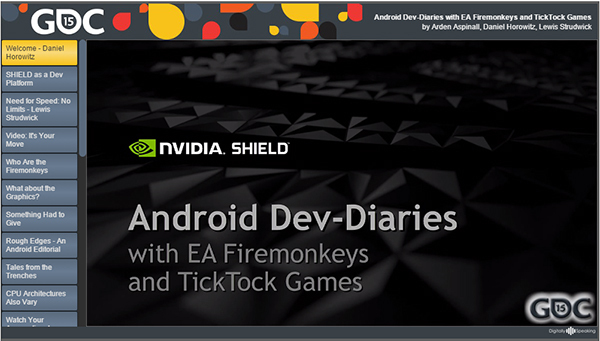 Coupled with OpenGL ES 3.1 and the Android™ Extension Pack (AEP), SHIELD provides developers with the ultimate platform to showcase their games using today's most advanced 3D rendering. This presentation shows how to take advantage of the features of these technologies using techniques once reserved for high-end PCs and consoles. The first part of this presentation is a round-table where several developers discus their experiences bringing high-end content to Android™. In the second part, we’ll dive deep with a detailed postmortem about porting a AAA PC title to NVIDIA® SHIELD™. 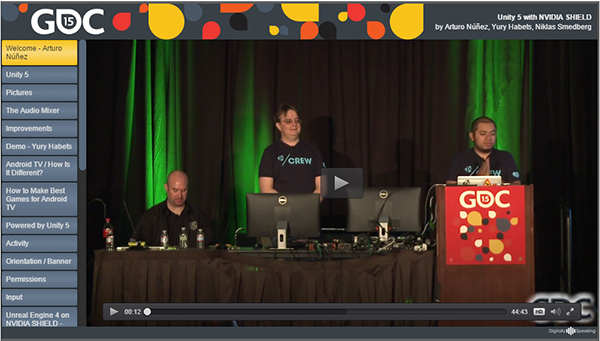 This video covers the basics of bringing your Android app to Android TV (ATV) and some NVIDIA SHIELD Android TV features. It focuses on non-gaming apps like multimedia, video and streaming apps, but the techniques are generally applicable to games as well. This short introductory video covers basic graphics quality settings in Unity and how they can be adjusted for powerful Android devices, like the NVIDIA SHIELD.